Soya is an important ingredient in Northeast Chinese cuisine. The nutritional properties of soya have been well-studied. If you think that your soya intake is limited to soya beans themselves, soya milk and tofu, you are wrong :) Actually, there are many different kinds of soya-made food products in North China— which, btw, are all among my favourite, no matter how you cook them. (Recently I learnt that Northeast produces really good soya beans because of its weather and different soil). Here in UK, there are many kinds of vegetarian meat substitutes made from soya, but they don’t have its original taste, which I like the most. In this post, I am introducing the most popular soya-based food in Northeast China and the popular ways of making them. Start from the original form in which soya presents itself in nature: soya beans. I have been looking for soya beans in normal supermarkets or shops like Holland and Barrett, but didn’t have any luck. Fortunately, soya beans are sold in most Chinese supermarkets in the UK. The beans are sold dried and hard, so if you decide to cook them, you need to soak them in water at least overnight to get them softer and ready for cooking. A popular way of cooking them is to stir fry them. I like to do it with little tofu pieces and carrots; or light frying them in the oil, until they become crispy — they can then can be taken as snacks or side dish. Although it is called soya milk in English, it is slightly different in China. In China, soya milk is slightly thicker, and is never ever mixed with any other juice (where here in the shops, they normally come with apple juice in it). 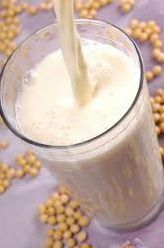 Nowadays, soya milk can be made at home by using a soya milk maker. If you remember to soak the beans the evening before, the next morning you can make pure soya milk in 10 minutes. (Once, I found a type of soy milk maker sold in US which does not require you to soak the beans in advance — which is cool, since I always forget it.) Soya milk is one of the most common food in Chinese breakfast . Well, I don’t think I need to say more about tofu (especially having said a lot about it in my first Tofu recipe). It is generally very easy to cook, and of course different ways of preparing it make the taste and texture different. 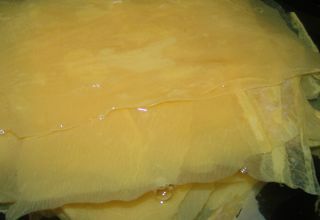 For instance, if you want to make the tofu firmer, and not to break the ‘cell’ too much, you can quickly boil it or steam it — it is good for making salad; if you only just want the the surface to get firmer, you can fry it with a little bit oil, it is good to pour the sauce on it, for example. If your tofu is accidentally frozen, DO NOT throw it away, it is the best! 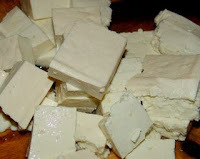 It is called ‘Dong Tofu’, means frozen tofu. 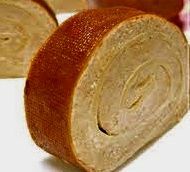 I think it is probably because Northeast China gets really cold in winter, tofu was easy to get frozen outside, (it was normally sold fresh in the open markets or streets), so North people created this way of preparing tofu. :)) And here, if I miss it, I would just leave the fresh tofu in the freezer for a few hours, until it is completely frozen, then take it out to defrost it for getting ready to cook. Traditionally it is cooked with pickled ‘Chinese leaves’, its taste and texture is very similar to ‘pickled cabbage’, so I use it instead. (– improvise again. :)) Nowadays, it is very popular for having it in ‘hotpot’ — Northeast Chinese style. Silken tofu appeared in Northeast Chinese cuisine only in the last, probably, twenty years. It is really soft, almost impossible to pick it up by chopsticks. In Northeast, apart from normal salad, soup or having savory sauce on top of it, the most popular dish is silken tofu and preserved duck egg salad， with a drop of ‘old vinegar’ — the taste is the best. :)) It can be found in almost all of the Chinese and Japanese supermarkets here, and they always in the similar packages. It is a kind of ‘homemade’ silken tofu — one of the traditional foods in North China. I still remember my grandma making it, and she used to tell the me the stories of having Tofu Nao when she was young. Traditionally, it is made from soya milk. Add coagulant to get it firmer, then pour prepared soup on top of it, have it with a spoon. The common soup to go with it is eggs, black fungus (Chinese mushroom). It is another common breakfast dish. Here, I normally buy the whole set from Japanese supermarket. In the package, soay milk powder substituted fresh one, and it comes with coagulant — very easy to make. It is our Sunday breakfast sometimes. In the Chinese supermarkets here, dried beancurd comes in two types, one is like ‘stick’, another one is in sheet. They both need to be soaked in water first. Since in North we normally have it in salad, I prefer when it is a bit ‘chewable’, I soak it in warm water (not hot) for a couple of hours, then make it into salad. Actually I don’t really know how to call it English, its original name in Mandarin can be mistaken as dried beancurd sheet in Cantonese. It looks like ‘light brown paper’. I only found it couple of times in Chinese supermarket here. We normally cook it in vegetable mushroom soup. Well, although the ones you can find are not really fresh ones (they are packed), and a little bit dry, it is more than enough for me. It is normally made into salad or stir fried — the recipes are on the way, since I just bought one pack two days ago. But if you could get one now, the easiest way is to spread some soy paste and put a piece of spring onion on the tofu sheet, roll it up, then — just enjoy!! Ha… it is the literal translation, otherwise it is called ‘Suji), so don’t get confused with the ones sold in Vegetarian section in supermarkets here. It is another form of tofu, not for making it as substitute for chicken. :) Again, very Northeast food, normally in salad or stir fry. But unfortunately, I haven’t seen any sold here, so I’d better not explain too much — till I go back home. I even lost idea of literal translation for this one. It is very similar to ‘Pressed Five Spice Tofu’ sold in the Chinese supermarket, but without pre-prepared flavor, like ‘Five Spice’. I used to buy it in a Chinese supermarket in Manchester, not exactly the same, it is with ‘a little bit’ Cantonese touch, but, we say ‘improvise’. It is normally stir fried with green pepper, for example. There are also some seasonings made from soy, like soy sauce, soy paste, soy oil. Anyway, soy products are one of most important food in every household in North China. Hope this could boost your interests in soy protein intake for healthy issue, and for having different taste of tofu dishes.